This is a painting that I did for a private commission. 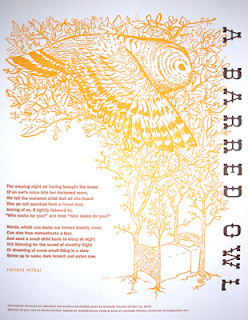 The first time I came into contact with Barred owls was via a poem for which I was hired to design a broadside. It was commissioned through Poetry Magazine to honor poet Richard Wilbur. The broadside was put together by Winterhouse Design and then letterpress printed by Chicago's Rohner Press. 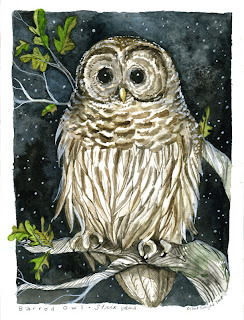 The poem mentions the Barred owl's "Who cooks for you? Who cooks for you all?" vocalization. Barred owls are widely distributed throughout the US in mature forests, and in some cases have been expanding their range. I heard one while back country camping in Southeast Wisconsin in the fall. It called as it swooped by my tent and startled me awake. It wasn't the "Who cooks for you?" pattern, but a maniacal, rolling laugh. It sounded more like a monkey, but seeing as this was Wisconsin, my mind sought other possibilities. And there you have my lightening fast naturalist skills of deduction in a nutshell. David Attenborough has nothing to worry about, eh? Really nice (as usual) Diana! We hear barred owls a lot around here and see them on occasion. We usually see them real close to the house - it's magical! Unfortunately, it's been a tough winter for them here - a general lack of food has driven them to hunting in the daytime and along the roads where the young ones are often hit (http://tinyurl.com/yqyefq).